Circles within circles, swirls within swirls. 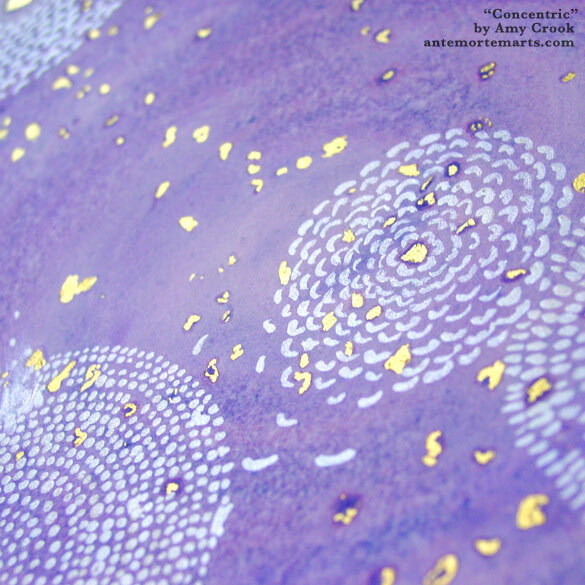 This abstract painting is full of shine and complexity, gold like scattered petals floating through everything while translucent, pearlescent white makes concentric shapes all through the complex background. 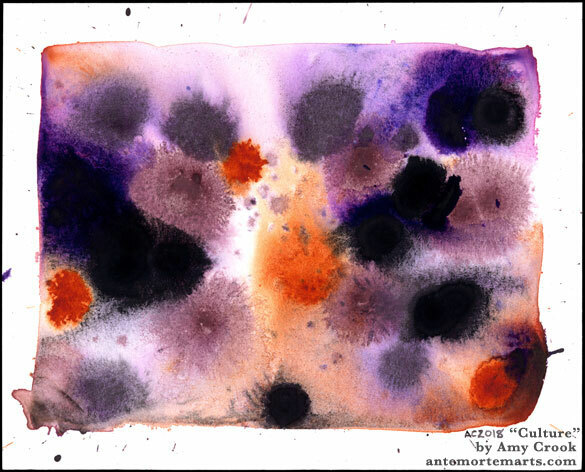 The violet has deconstructed itself as much as everything else, red and blue visible in places while still letting the eye find purple first and foremost. The first in a series, this painting is immensely fun to sit and play with, moving it back and forth so the different metallics catch the light or vanish into the shadows like floating seeds sinking below the water. 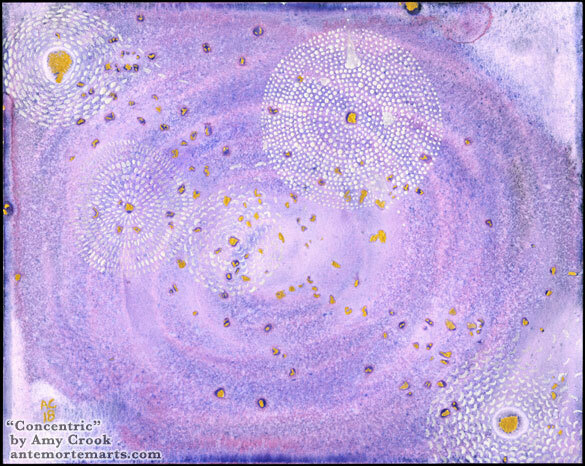 Above, you can see the shimmering white pearl and gold paints catching the light, giving up their translucency and becoming solid, floating above the purple instead of fading into it. 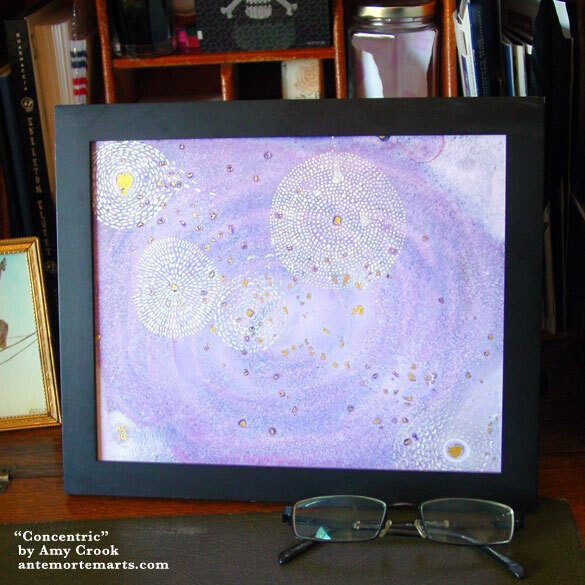 Below, the painting is waiting in a frame to be mailed off to its new home. 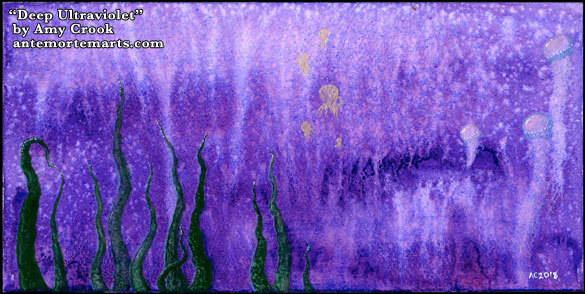 In the violet depths of some mysterious sea, light filters down to find shining octopuses, waving tentacle fronds, and frolicking jellyfish. 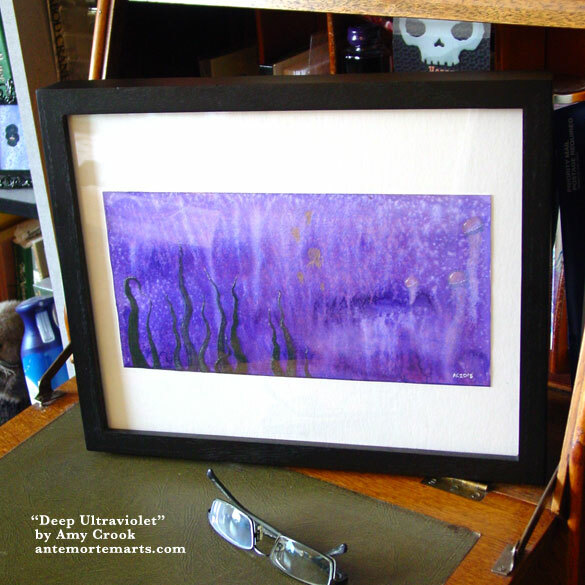 Ultraviolet is the Pantone color of the year, and somehow the word seemed to fit this mix of vivid purples and shining metallics. There’s a sense of more going on than the eye can see, life just around the corner of vision. What lies deep in these oceans? 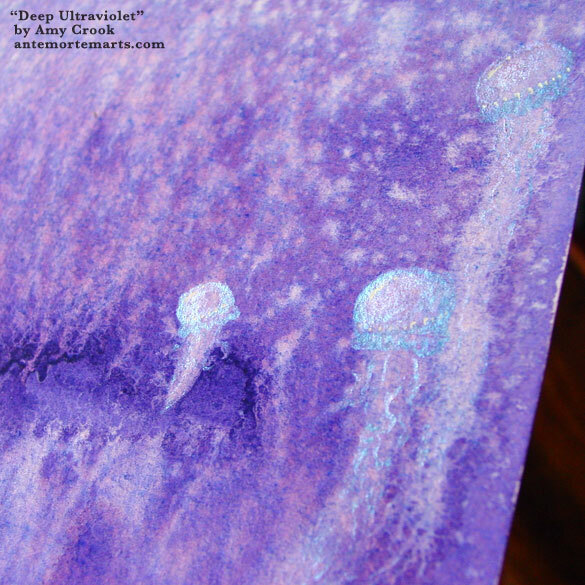 Above, you can see the iridescent blue and duochrome mauve highlights on the floating jellies. 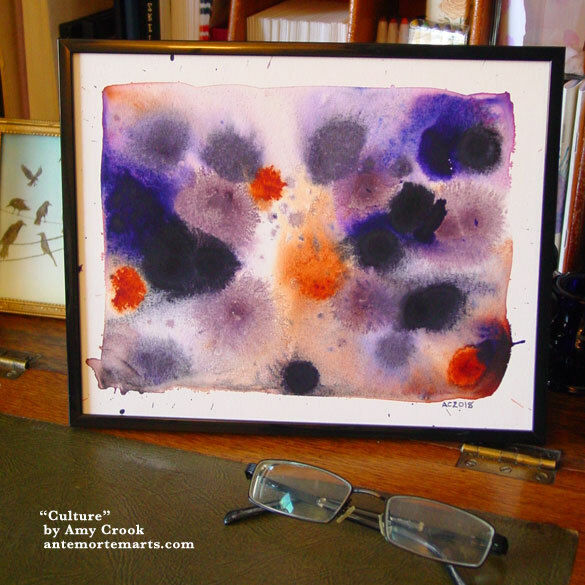 Below, this art is in a temporary frame, waiting to bring its gorgeous mystery into your beautiful home. 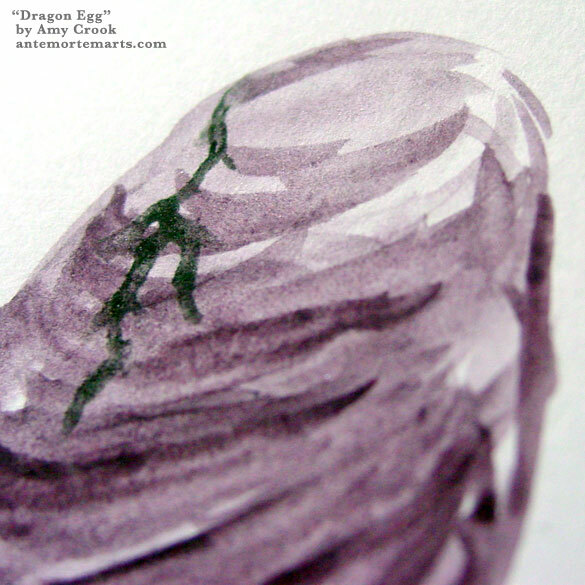 This little egg is just starting to crack, its surface full of rough spirals and gradations in color. 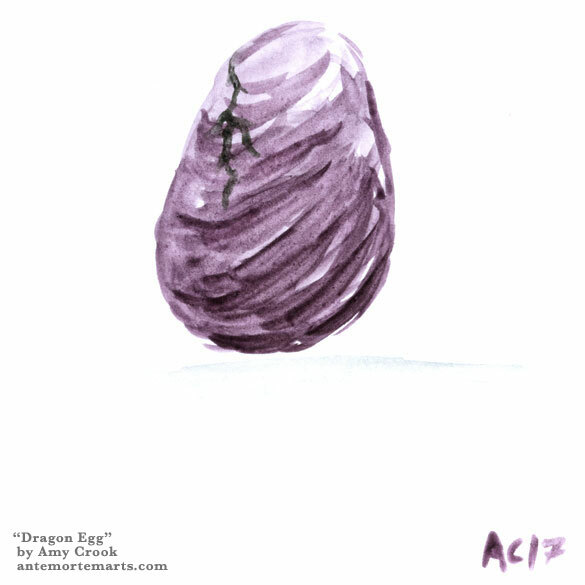 If you’re wondering what hatches out of such an egg, you can just keep scrolling and see the magnificent spiral purple dragon that it will grow into. 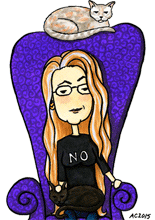 What else do you have in your life that’s like that, and how can you nuture it? 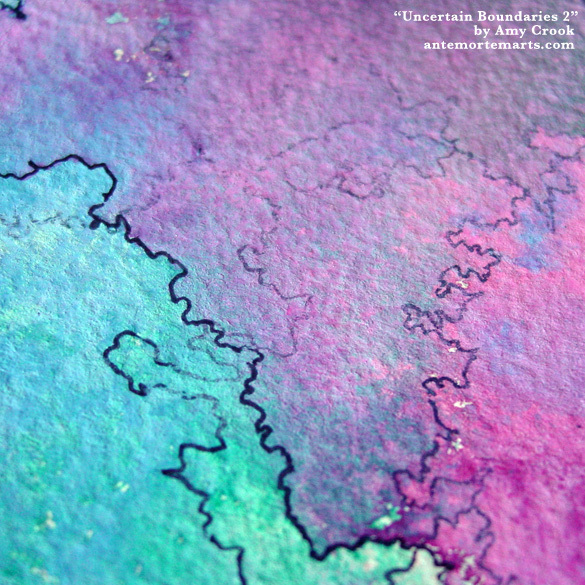 Above, you can see the soft textures of paint and paper, just two colors of minerals to make up this whimsical image. 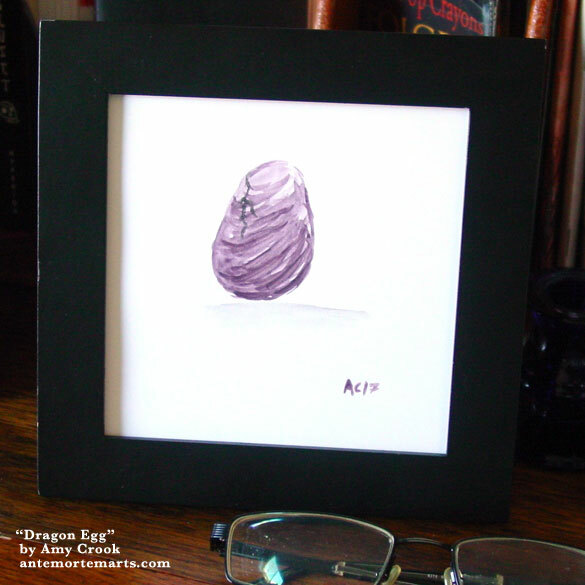 Below, the egg is waiting in a frame to incubate and hatch whatever’s inside. If you’re still having apocalypse feelings, here’s another vision of a terrible future for you! The shimmering blue moon has a fissure at its heart, and another mysterious light shines through the clouds high above. 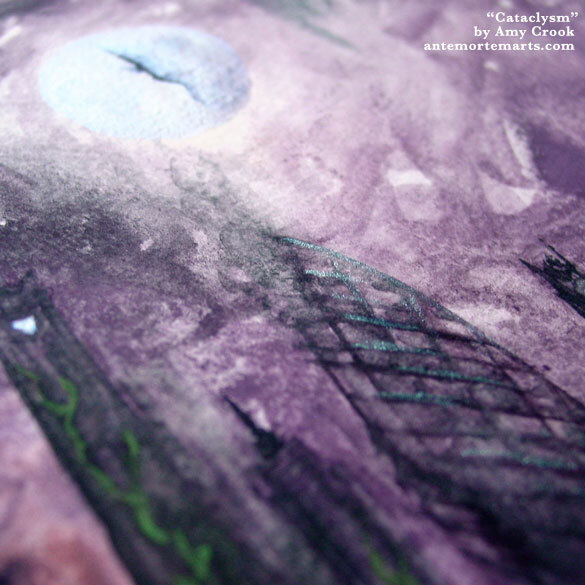 The skies are charcoal and violet with whatever destruction came through, and the buildings are blackened ruins. 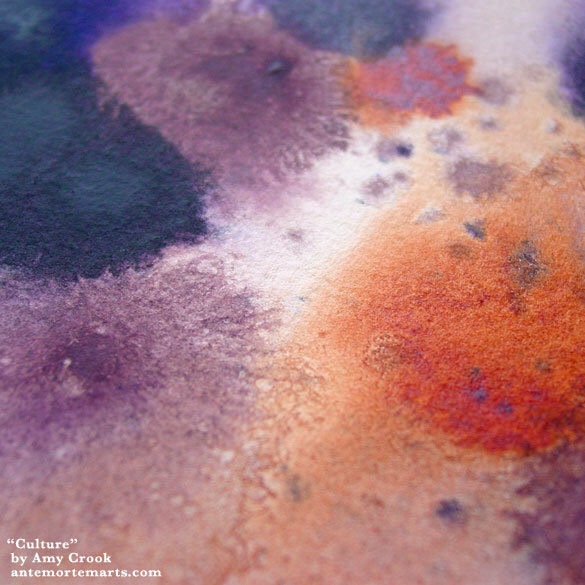 Greenery crawls up the sides of some, while others still smoke or are ochre with rust. Whatever city used to stand here, there’s not much left. 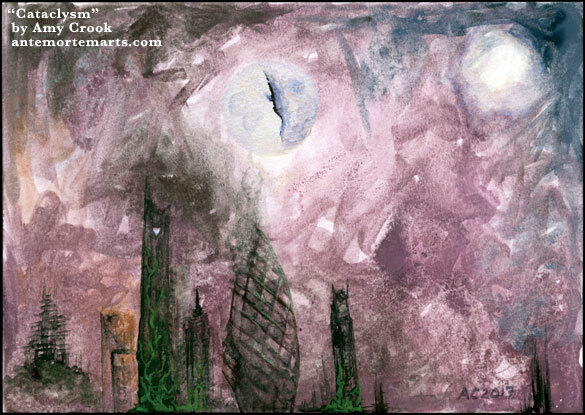 Above, you can see a close-up of the ruined gherkin building, and the iridescent paint on both it and the moon adding just a bit of light in the smoky darkness. Below, the painting sits in its frame looking innocuously non-prophetic. 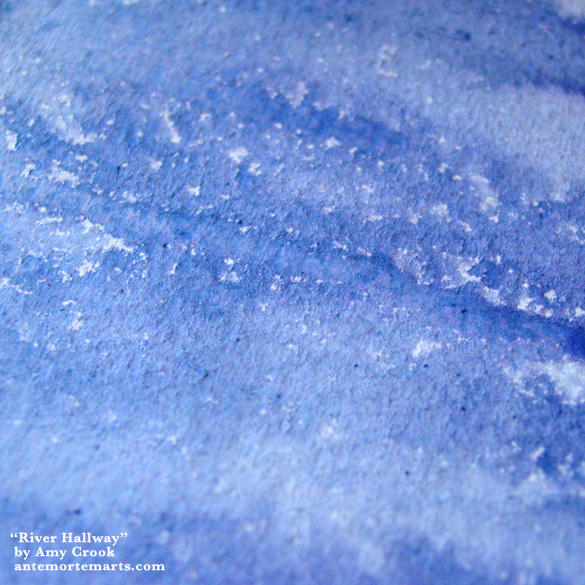 Like soothing waves of water, this blue-violet color contains surprising amounts of detail once you look past the initial impression. There’s a very subtle hint of sparkle here and there, the smallest shapes of water and spray, and of course the more obvious gradations of flow. The tall, narrow rectangular shape echoes a hallway flowing with water rather than a more natural stream. 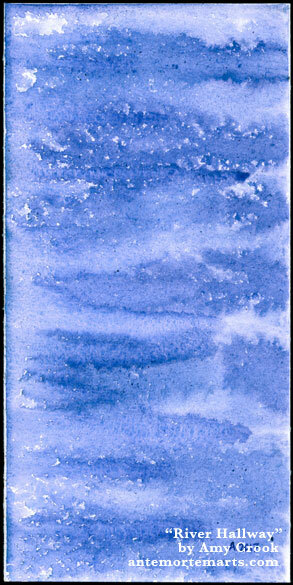 Above, you can see the tiny details, flecks of paint and flecks of white like foam and stones in the water. 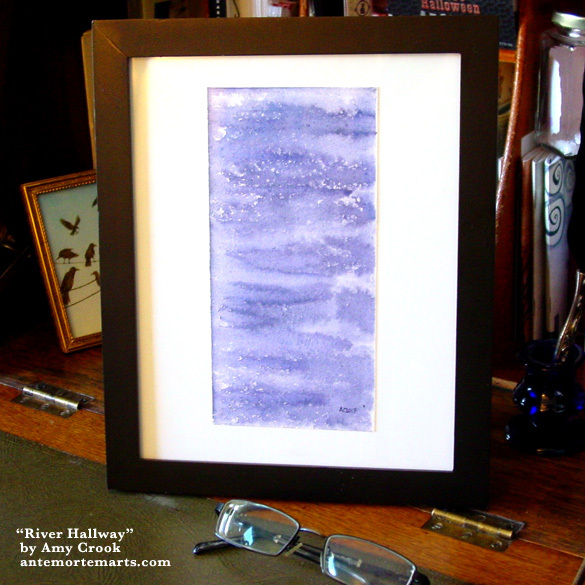 Below, the painting is trapped in its frame, a piece of time forever frozen under glass. 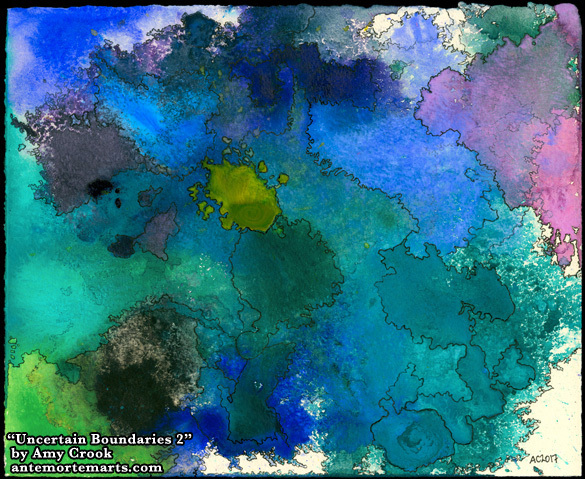 Layers of boundaries obscured but not always obliterated by the shapes that form atop them. A world that is always shifting, changing, adapting to the forces that make and move borders. A history hiding in the blend of color, the sparkle of truths that won’t stay buried. 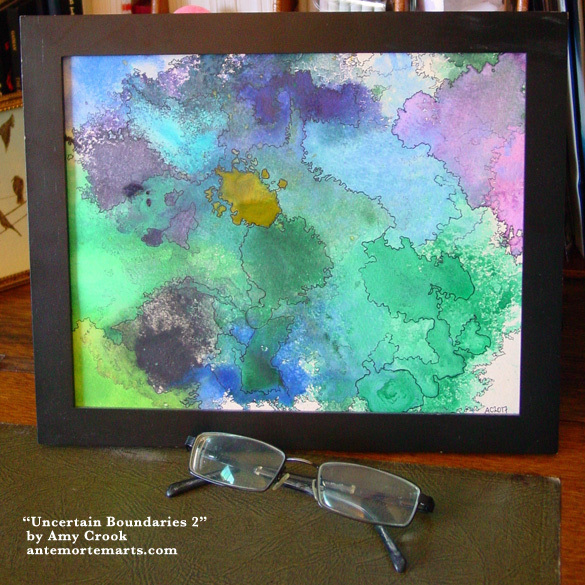 Uncertain Boundaries 2 is another Map piece, mixed media artworks that create imaginary places and invite the viewer to explore them. What history do you think has happened here? Above, you can see the half-obliterated history of these strange countries, lines still there in memory but outweighed by the present. 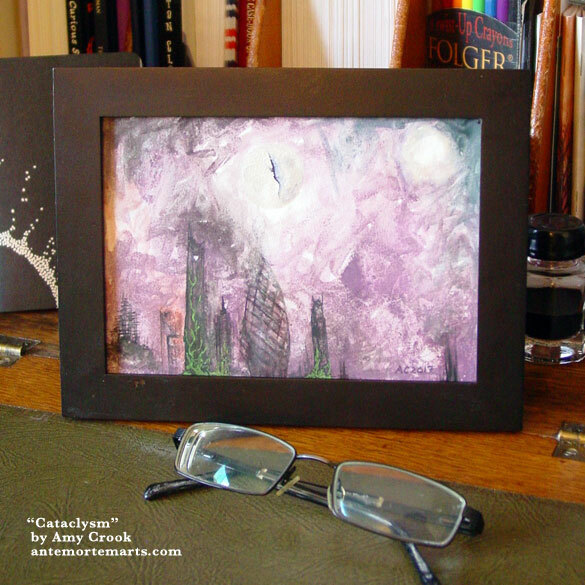 Below, this piece is in a frame, waiting to add some mystery to your walls.